Tag Archive | "windows 10 mobile"
Quad-cores and Windows Mobile. My kit-list, March 2016. I’ve been busy. I’ve just uploaded the 60th review for Notebookcheck and I now have to admit that exposure to high-end laptops and high-end smartphones has had an effect on how I approach ultra-mobile PCs. My work processes have changed too so I now use a slightly different range of computers than I did one year ago. Mobility plays an important part, there’s a Chromebook in the list and I’m still using Windows Mobile, despite being so, so tempted to buy a Sony Xperia Z5. Here’s my current kit-list. I’d love to hear about yours, and your usage scenario, in the comments below. HP Elite X3 and the Continuum showcase. 10 years ago today I posted a set of blog posts about the need for a 5-7 inch mobile internet device. The Carrypad Journal covered the early days of the Windows tablet, the growth of consumer tablets and the evolution of mobile productivity. It’s a pleasure to be writing about a very intresting new product from HP today. The HP Elite X3. Combining Win10, UWP, OneDrive, Continuum, ARM and Intel in one productive demo. I demonstrated an interesting setup at an event in Germany this week. It’s a PowerPoint presentation created on an Intel Compute Stick. It’s updated to Windows 10 and running Office Mobile. OneDrive keeps multiple devices in sync and Miracast is used for the presentation. I’ve reproduced the demo in a video below. Two ‘PCs’ and a wireless receiver. The Powerpoint app also runs on an Ultrabook and gets updated live after editing on the Compute Stick. I then take a Windows 10 Mobile Lumia (a cheap one) and cast the same file, using the same Windows 10 app, to a big screen. It’s a complex demo but it’s a really interesting one because it shows that you can indeed get productive with a low-end Atom-based stick using Windows 10 Universal apps. It also shows what is going to be possible with Windows 10 Mobile phones when Continuum is available. You might not need the PC at all! Miracast is used for the wireless display from the phone but with Continuum-enabled phones you’ll also get HDMI or DisplayPort over a USB-C connector. You could also substitute the phone for a pen-enabled tablet if you wanted to annotate. Again, Miracast would be possible if you wanted untethered use. 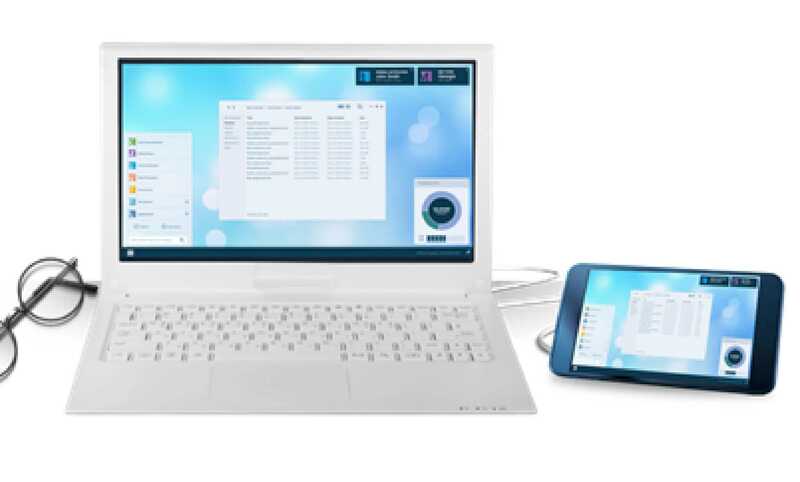 Universal Apps, cloud-sync and Continuum are going to enable some interesting usage models. Watch the video and let me know your thoughts below. UWP and Continuum update. Will current Lumia phones work? 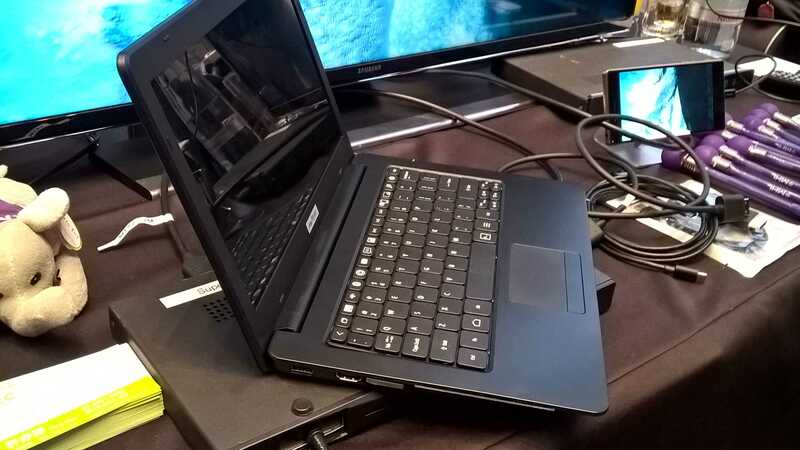 After learning that the Amtran barebones laptop had been used on-stage at BUILD this year I tracked down the relevant presentation and am pleased that I did. There’s some really good information about Continuum in there along with some excellent demos. Important things to note are the Miracast continuum demo, which doesn’t need a physical video connector, and the projection mode, again, something that Miracast is perfect for. There’s also a Continuum control application that works as a touchpad for a remote screen. Microsoft already have a set of UWP apps that are available via PCs but as soon as Windows 10 hits smartphones there’s going to be an opportunity to enjoy a new type of ultramobile computing…or is there? Indications are that new smartphone hardware is needed to enable Continuum features. News Comments Off on UWP and Continuum update. Will current Lumia phones work? I didn’t get to see Acer’s ‘PC Phone’ launch at IFA as I was heading to their booth to check out the new Switch range, a new Chromebook and the Cloudbook. Since then I’ve tried to find out more details about the implementation and the dock and I’ve made some enquiries. 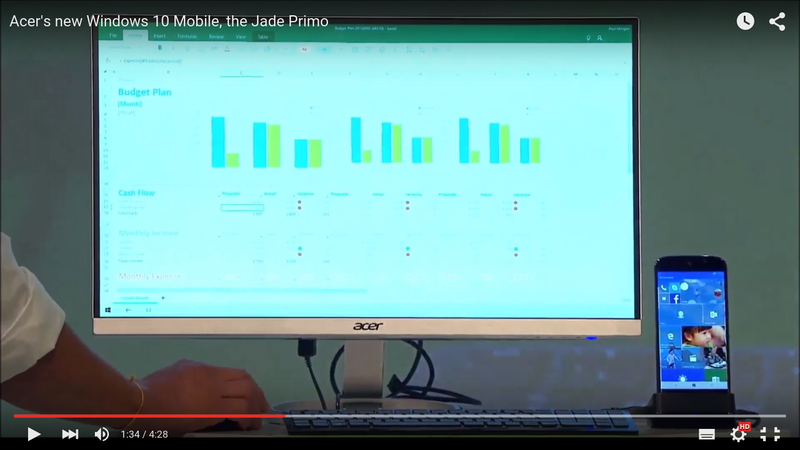 The Acer Jade Primo – ‘your pocket PC’ – is the first real product we’ve seen demonstrating the new technologies that will enable your phone to be your desktop. 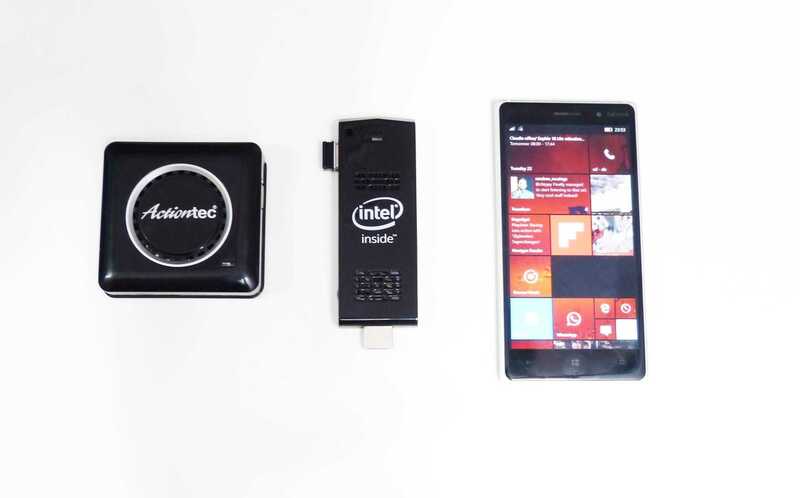 Windows 10 Mobile, Continuum and USB-3.1. Think about the Continuum Laptop. Last week I wrote about the Universal Windows Platform (UWP) and how it could drive adoption of the Windows 10 Mobile ‘smartphone’ as a core computing device for all consumer needs, whatever the screen-size or input method. The Lumia 950 rumor and that image of the USB-C dock brought back memories of the Continuum demo at BUILD 2015 and it doesn’t take a lot of imagination to see that extending into barebones laptops driven by Windows 10 Mobile devices. At IFA I saw another interesting accessory. It’s not a smartbook but could be a smartphone-book. A phab-book perhaps. OK, I’m still working on the name! Post-PC is Windows 10 and a fading desktop, UWP success. With Windows 10 comes a potentially huge change in the way that the 5-10 inch consumer computing category will be addressed by manufacturers. As in the Windows 8 era, manufacturers can still choose between ARM and x86 options, desktop and no-desktop options but this time round there’s the possibility of crossover. If the Universal Windows Platform (UWP) is a success then why not allow Windows 10 Mobile tablets to compete with large Windows tablets and small laptops? The inclusion of ARM in this segment could increase competition and lower prices which is a bonus for Microsoft. It could also reduce the desire for a ‘desktop’ and puts consumer Windows devices at risk from competing post-desktop products.